The “Find” function allows you to locate single records or a set of records within the database. Note that when you are “Find” mode the fields are indicated by a magnifying glass. You can perform Find requests based on any field in the database. Simply enter the information into the field, and press “Enter”. Select the desired activity from the field “Activity associated with incident”, and press “Enter. Enter the persons’ first or last name, and press “Enter. In the Date of incident field, type: 2012, and press “Enter. 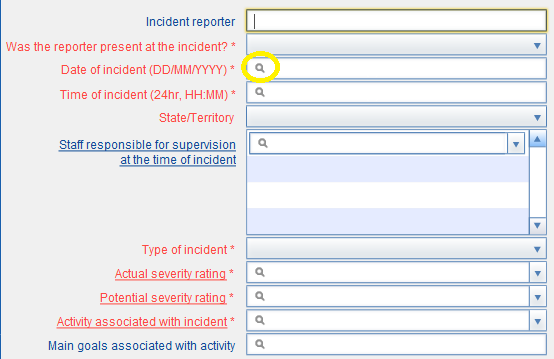 In the Date of incident field, type: 12/2012, and press “Enter. In the Date of incident field, type: 1/7/2012 .. 30/6/2013, and press “Enter.